The Fellowes Galaxy 500 Manual Plastic Comb Binding Machine is a high performance manual binding machine designed for frequent use in a medium to large office environment. This heavy duty comb binding machine manually punches up to 25 sheets at a time with a minimal ammount of effort and is capable of binding documents up to 500 sheets thick using a 2" binding comb. The Galaxy Manual Binding machine utilizes vertical document loading to help ensure accurate punch alignment. It also includes a unique removable binding mechanism that can be used separately for increased productivity. The Fellowes Galaxy features a built-in comb storage tray with an integrated document measurement device for added convenience and quick set-up. Using the adjustable rotary edge guide it is possible to quickly and easily center documents for punching. The Fellowes Galaxy 500 features a front-access waste tray for easy, mess-free waste disposal and a binding starter pack. Heavy duty machine for frequent use in large offices. Punches up to 28 sheets at a time with a minimum of effort. Works well, the design is sleek and looks nice. I like the feature of the removable binding section. One person could be punching and another binding in another location which makes production faster. I worry slightly about the longevity of some of the plastic parts, I guess only time will tell. This one is excellent! I bought a cheaper model at Office Max and it was a piece of junk. This one works great and it was here in 2 days. I must admit I initially got hooked with this machine just because of its sleek look. After researching reviews on Amazon and office websites I decided to give it a go and it turned out to be a great buy! Machine was actually bigger than image, extremely sturdy and well built. Comb opener runs smoothly. I found it's very easy to punch, not much force is required (no pressure on high heels...). Very pleased with the purchase and got lots of compliments from the girls in the office. Oh btw, don't throw away the colourful chips from the chip tray, save them for office birthday confetti!!! Transcript: Welcome to MyBinding video. 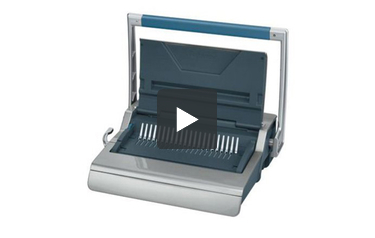 This is a demonstration video of the Galaxy 500, a plastic comb binding machine by Fellowes. The Galaxy 500 is an all-in-one punch and binding machine for plastic comb binding. Let's just watch how simple it is to make a book. Welcome to MyBinding video. 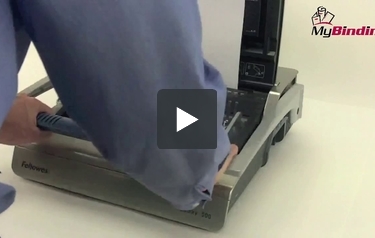 This is a demonstration video of the Galaxy 500, a plastic comb binding machine by Fellowes. The Galaxy 500 is an all-in-one punch and binding machine for plastic comb binding. Let's just watch how simple it is to make a book. On the top of the machine are three buttons. You select and they disengage punching dies; allows you to punch standard, cover, or A4 sized documents. Once that's selected, you can begin. Lift the lever, lift the hood, and you're ready to go. Let's begin by punching the covers. Slide them into the back of the machine into the throat. There's a margin control knob on the left hand side that you can use to adjust to make sure that all punches are made consistently throughout your project. Punch down. Once you're sure the punches you're making are in the right spot, continue on through the rest of the papers in your project. You'll want to punch your project through in batches of 20, no more than 25 sheets of 20lb paper at a time. When that's all done, assemble your project. It's time to bind. On the front of the machine, there's a small tray that can carry a number of plastic combs. There's also a very handy measuring to by which you can place your finished project into to find which size comb is best for your project. Once that's selected, close the tray; let's begin. Place the plastic comb over the metal teeth in the back. Always keep the plastic teeth faced up and the project faced down; that way the project does not fall apart in use. Open the comb with a lever on the left hand side, just enough to thread your project over the teeth of the comb completely. Adjust as you need. When everything is through, close the comb and you're through. It's as simple as that. On the left hand side there's a small chip tray that will contain all the waste from your punches. The Galaxy 500 will also allow you to remove the comb opener and closing unit, allowing two people to work simultaneously, one to punch and one to bind. This increases productivity. Punching on the right, binding on the left. It really is that simple and that efficient with the Galaxy 500 by Fellowes. For more demos and reviews of this product and many more, check out MyBinding.com. Transcript: Welcome to MyBinding video. This is a product review of the Galaxy 500, a plastic comb binding machine by Fellowes. The Galaxy 500 is a great little machine for plastic comb binding. It punches and it binds all in one. It has a number of features worth noting; let's do so step-by-step as we watch it in action. Welcome to MyBinding video. This is a product review of the Galaxy 500, a plastic comb binding machine by Fellowes. The Galaxy 500 is a great little machine for plastic comb binding. It punches and it binds all in one. It has a number of features worth noting; let's do so step-by-step as we watch it in action. Of first note are these three knobs on the top. They actually disengage punching pins. That allows you then to punch A4, oversize, as well as standard size documents, which is nice for a machine that is otherwise unable to change its punch configuration. We like this Galaxy stowaway design; easy for storage and it looks nice. However, as you can see here, the lid is a little annoying when placing papers into the throat. It doesn't really get in the way, and neither does the handle as some models do. However, it's just a little awkward to beginners. Punching is easy with the double handed lever. Both right, left, and two-handed can all be done. The punch capacity is quite impressive on the Galaxy 500. First of all, it claims to do 25 sheets in one lift and it actually can. However, it is a bit of work, as you can see here. But it does work. I would think more 18, 20, 22 sheets at the max to be most efficient and easily done. We like the chip tray at the base of the machine that comes out on either the left or right side. Very convenient. When it comes to the binding step, the machine looks like it might be a bit awkward but it really isn't. In the front is a small tray that can carry a number of plastic combs. Not a whole lot, mind you, but it can be helpful. But inside is a fancy little tool that allows you to place your completed project inside the slot so you can select the best comb size for your project. We like the fact that the teeth on the comb opener as well as the handle are both made of metal. Sometimes these are plastic and break and render the machine worthless. And it can handle plastic combs up to two inches in diameter, which means this can be a project of up to 500 sheets. A really nice feature on the Galaxy 500 is the removable binding tray. This turns a one person station into a two person station; one to punch and one to bind, increasing productivity incredibly. Our price is just under the $375 mark and probably well worth it if this is the kind of binding you need. For more demos and reviews of this product and many more, check out MyBinding.com. The Fellowes Galaxy manual plastic comb binding machine is designed for frequent use in a medium to large office environment. This machine offers a sleek contemporary look that is designed to blend into an office environment. Although the Galaxy offers a similar look to the Star, Starlet, and Quasar comb binding machines, this machine offers a number of improved features that makes it a great choice for larger volume users and offices. The Fellowes Galaxy manual comb binding machine offers an impressive punching capacity of 25 sheets. This is one of the largest capacities that we have seen offered by a manual comb binding machine. Plus, the design used by the punching handle made it easier to punch the maximum capacity of the machine. One of the real strengths of this machine is its contemporary design. Many other plastic comb binding machines have an industrial look that sticks out like a sore thumb in an office environment. The Galaxy is designed to fold closed when it is not in use and uses a combination of gray colors and smooth curves that helps the machine to blend in with desktop printers and other contemporary office equipment. This machine offers a unique style of comb opener that can be removed and used separately to increase productivity. That allows one person to punch documents and another to insert the pages onto the binding combs. The comb opener uses a separate handle on the side of the machine and it can handle plastic combs up to 2 inches in diameter. The Galaxy binding machine offers a rotary edge guide to easily adjust the side margin on the punch. The machine is designed primarily for users who need to bind letter sized documents with flush cut or oversize (8.75″ x 11.25″) covers. However, it also offers the ability to selectively disengage three of the different punching pins for users who are looking to bind half letter size and A4 sized documents. The machine has a built in storage tray that slides out of the side of the machine. The storage tray can hold a few plastic combs for convenient access and also offers a document sizing guide that helps you determine the correct size of plastic comb that you need for your documents. The sizing guide will also help you to match up loose plastic combs so that you can determine what size they are. Although the punching capacity on the Fellowes Galaxy is impressive, organizations that do a lot of binding may want to consider a binding machine with an electric punch. Fellowes offers an electric version of this machine for about $150 more. It is an upgrade that some organizations may find worthwhile. It was nice to see Fellowes include some disengageable dies on this machine. However, there are still only three releasable punching pins. Many other more industrial manual comb binding machines in this price range offer fully disengageable dies which allow users to punch virtually any size of document. The storage tray on this machine seems like it would be a really useful feature. However, it isn’t large enough to hold any real volume of plastic binding combs. The document measurement tool is useful but it would have been nice if they made the comb storage area larger. For a medium or large sized office, the Fellowes Galaxy manual binding machine is an excellent choice. It offers a sleek contemporary design that will blend in with other office equipment without looking industrial. It offers an excellent punching capacity, a removable plastic comb opener and the ability to bind documents in a wide variety of lengths and thicknesses. However, offices that need to do a lot of binding may want to consider upgrading to a binding machine with an electric punching mechanism. This machine is also not a good fit for organizations that need to punch custom length documents or need to bind legal sized sheets. Dimensions 6.5" x 21" x 17.75" 6.5" x 19.62" x 17.75" 5.12" x 16.87" x 15.37" 5.12" x 18.12" x 15.37"